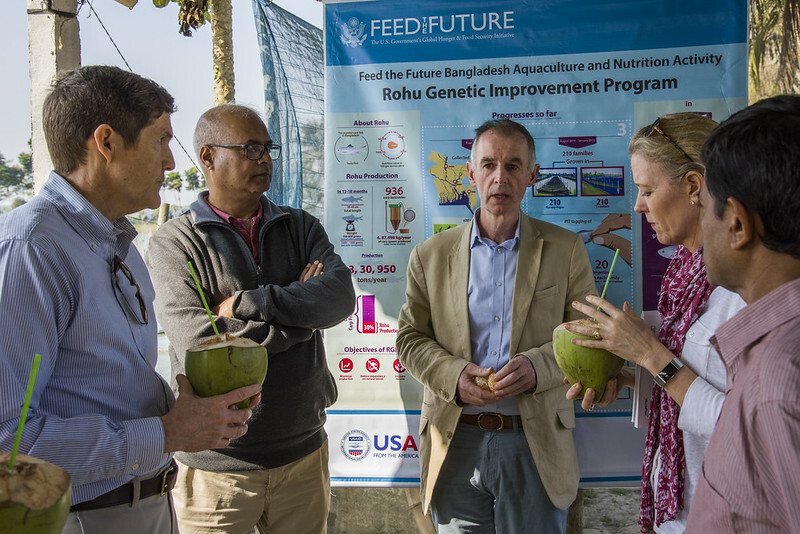 The US Ambassador to Bangladesh Earl R. Miller visited the Carp Genetic Improvement Program in Jashore District on 11 February 2019. 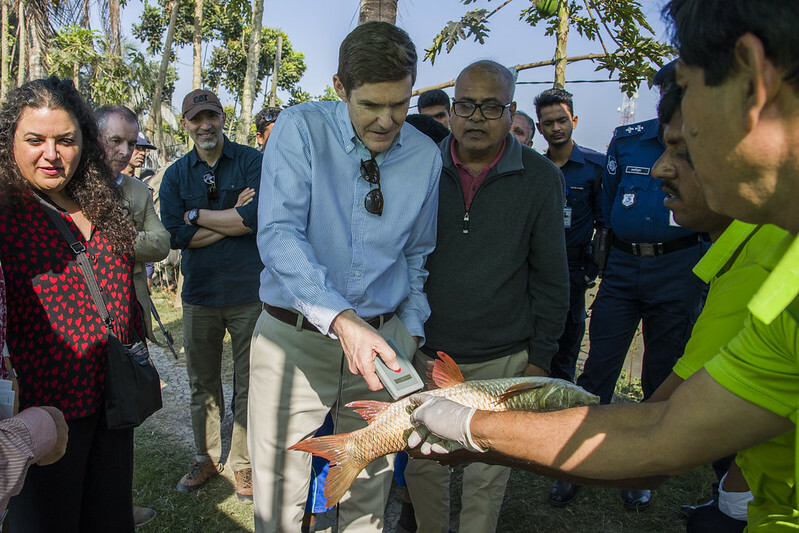 The visit was an opportunity to present the outcomes of the USAID-funded Aquaculture for Income and Nutrition project, which ran from 2011–2017, and to introduce the USD 24.5 million follow-on investment, Feed the Future Bangladesh Aquaculture and Nutrition Activity, which began in February 2018. WorldFish is leading the program, which is being implemented as part of FISH. WorldFish Bangladesh Country Director Dr. Malcolm Dickson, Carp Genetic Improvement Program Manager Md. 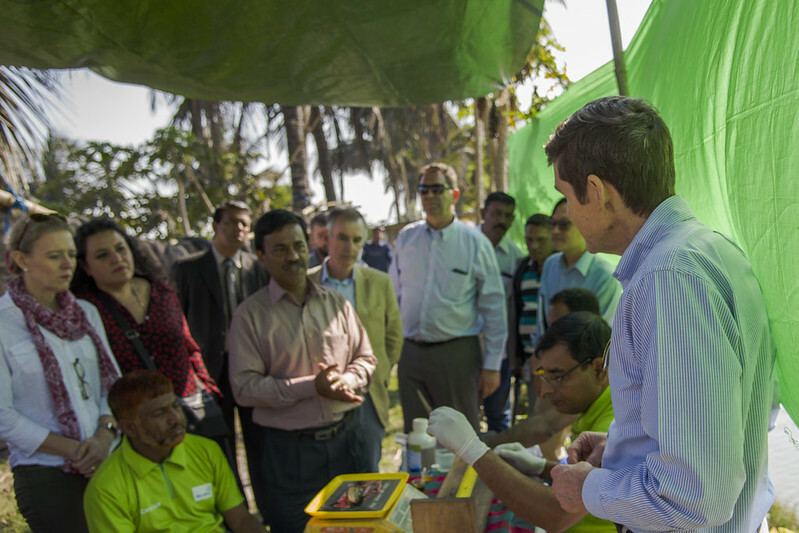 Badrul Alam, USAID officials and WorldFish staff were among those who took part in the visit to the Talbaria research station in the southwest of the country. Carps are the most important fish species in Bangladesh, making up more than 80 percent of aquaculture production. The most farmed species are rohu, catla and silver carp, which account for 25, 21 and 19 percent of the total production of fish from ponds respectively. These fish are commonly grown together in multispecies systems, known as polyculture. However, commercial hatcheries in Bangladesh rely on wild broodstock to produce the fry for commercial farms, which often results in low productivity. WorldFish has been running genetic improvement programs for the major carp species since 2013, as part of a long-term plan to improve fish farmer access to quality seed of the improved species. The impact of this on increased aquaculture production in Bangladesh could be significant. The Carp Genetic Improvement Program produced its first selected generation of rohu in 2016, and has established base populations of catla and silver carp—the essential first step in developing a selected breeding program. It is expected that after three generations of selection the various carp species should have an improved growth performance of at least 30 percent, compared to unselected fish. The third generation of fish seed will be made available for commercial mass reproduction through private and public fish hatcheries.